The laminin-binding integrin α6β4 plays key roles in both normal epithelial and endothelial cells and during tumor cell progression, metastasis, and angiogenesis. 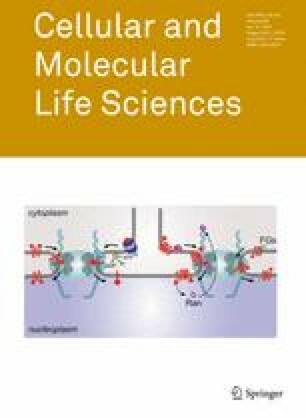 Previous cysteine mutagenesis studies have suggested that palmitoylation of α6β4 protein supports a few integrin-dependent functions and molecular associations. Here we took another approach and obtained strikingly different results. We used overexpression and RNAi knockdown in multiple cell types to identify protein acyl transferase DHHC3 as the enzyme responsible for integrin β4 and α6 palmitoylation. 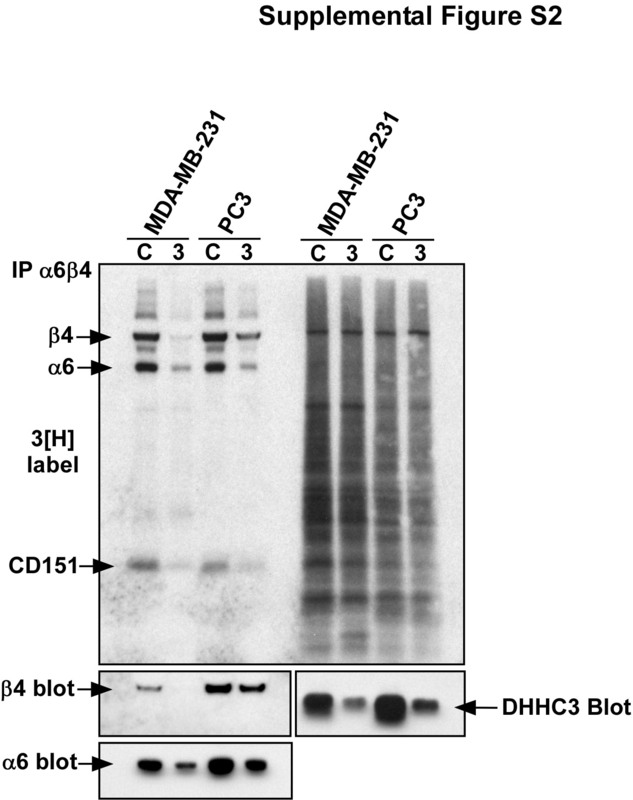 Ablation of DHHC3 markedly diminished integrin-dependent cellular cable formation on Matrigel, integrin signaling through Src, and β4 phosphorylation on key diagnostic amino acids (S1356 and 1424). 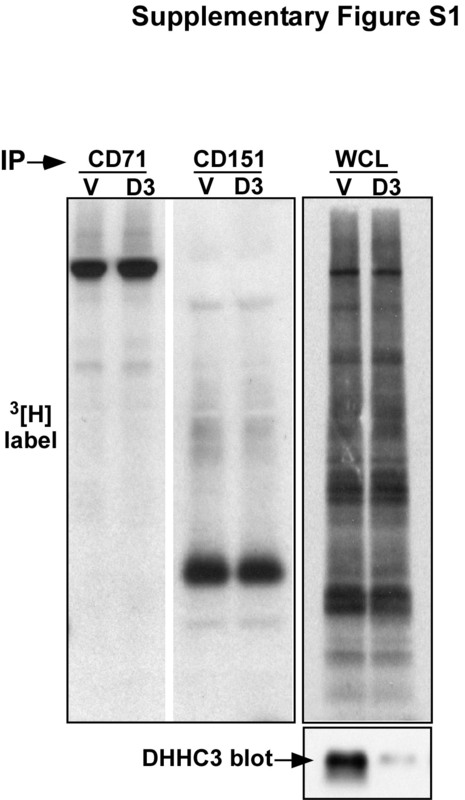 However, unexpectedly, and in sharp contrast to prior α6β4 mutagenesis results, knockdown of DHHC3 accelerated the degradation of α6β4, likely due to an increase in endosomal exposure to cathepsin D. When proteolytic degradation was inhibited (by Pepstatin A), rescued α6β4 accumulated intracellularly, but was unable to reach the cell surface. 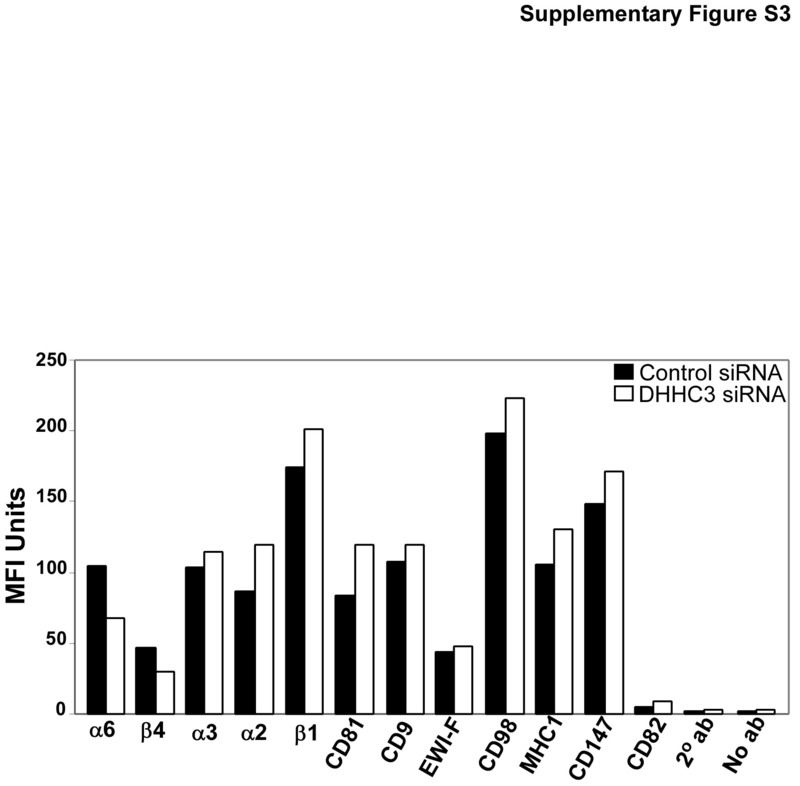 DHHC3 ablation effects were strongly selective for α6β4. Cell-surface levels of ~10 other proteins (including α3β1) were not diminished, and the appearance of hundreds of other palmitoylated proteins was not altered. 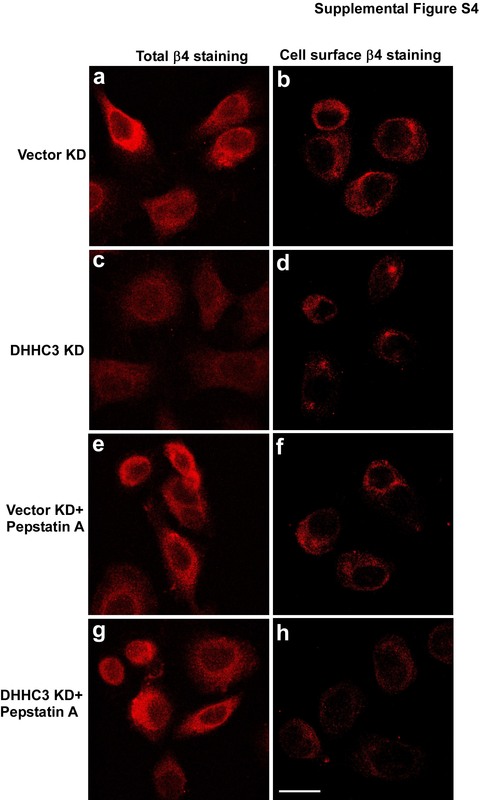 Results obtained here demonstrate a new substrate for the DHHC3 enzyme and provide novel opportunities for modulating α6β4 expression, distribution, and function. The online version of this article (doi: 10.1007/s00018-012-0924-6) contains supplementary material, which is available to authorized users. We thank Dr. Hong-Xing Wang for assistance with confocal microscopy and for providing a control vector. This work was supported by National Institutes of Health Grant GM38903 (to MEH).